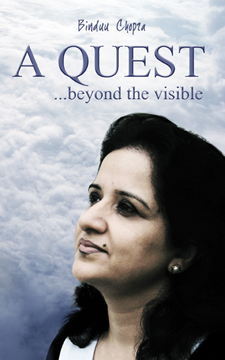 of Binduu Chopra's book A Quest...Beyond the Visible published by Creative House International Press, Inc. The book is about the oneness between a Guru and the Student in Pursuit of self; a quest beyond the visible until the fire within is ignited, the soul of the student is empowered enough to be alive to life. The book is all about finding the Ignition Key to the true self within. Binduu has always had the desire to grow better, though she knew that she was unique in her own way. Besides keeping a neat cozy home, her interest and hobbies include, Reiki & Feng Shui. She has green fingers. Her love for nature speaks through the pictures that she captures. The only thing she can’t let go of is her brushes – actually floral’s in watercolors! She loves shells, candles, stones and woods that include trees, creating & designing small artifacts to recycle wood. Having taught children at school for over eight years, she felt the need for her own personal expansion and she accepted this change. Binduu had the desire to feel whole and complete. Allowing her to respect her abilities, she opened herself to acceptance and became more aware of her whole self. And while you read, Binduu continues to write her next book that you will find on the shelves soon. This does not mean that she only writes, she smiles, laughs and loves. When she loves; she forgives. When she forgives; the love within her grows. Binduu has been lucky to understand life and to evolve. She writes with a hope that her faith will provide answers to unanswered questions in many minds. Binduu’s challenge is to continue with her research in the path, to understand the wholeness within her own self. Mention the title, author and/or ISBN 978-0-9830355-9-6.